On Lake Superior. Courtview rooms or upgrade to lakeview rooms. Historic Scandinavian lodge with handhewn beams and fireplace. Upgrade to hand-crafted log homes overlooking lake, lakeside villas, luxury condominiums. In-room whirlpools and fireplaces available. Lakeside fine dining, pub with casual dining. Pool, whirlpool, sauna, complimentary par 3 golf, shuffleboard, pebble beach with evening campfires, covered bridges, walking trails. A challenging section with many ups and downs. Scenic overlooks at Oberg and Moose Mountain. Maple forests to boreal forest of spruce, birch, balsam fir and alder. Trail emerges at Poplar River gorge. Hike along the Poplar River and Lake Agnes. Maple forests to boreal forest of birch, aspen, pine and spruce. Spur to White Sky Rock overlook and view of Caribou Lake. 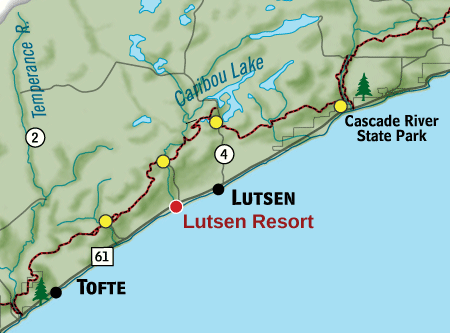 Follows the ridgeline offering views of Lake Superior through hardwood forests, crossing many streams. A variety of habitats including maple forests to cedar groves, massive beaver dam to wide-open hillsides.